What you need to know to help your child have a positive third grade experience. 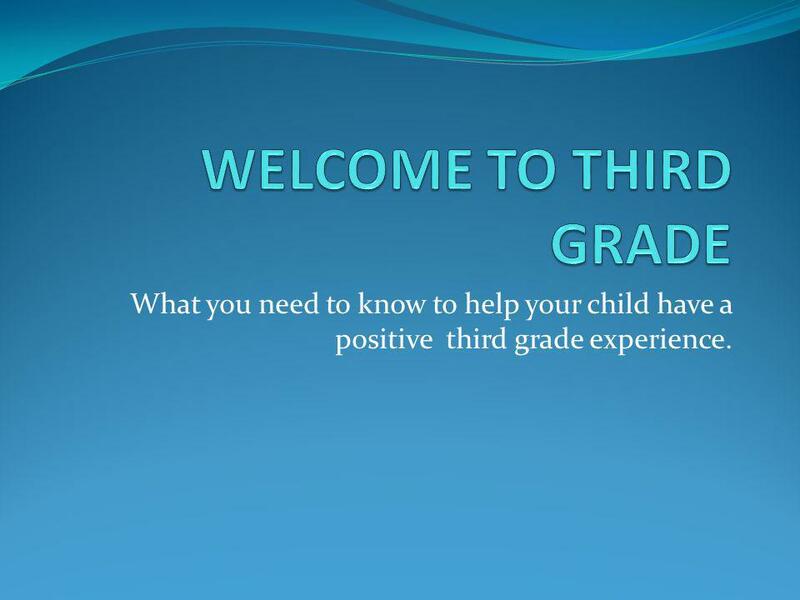 1 What you need to know to help your child have a positive third grade experience. 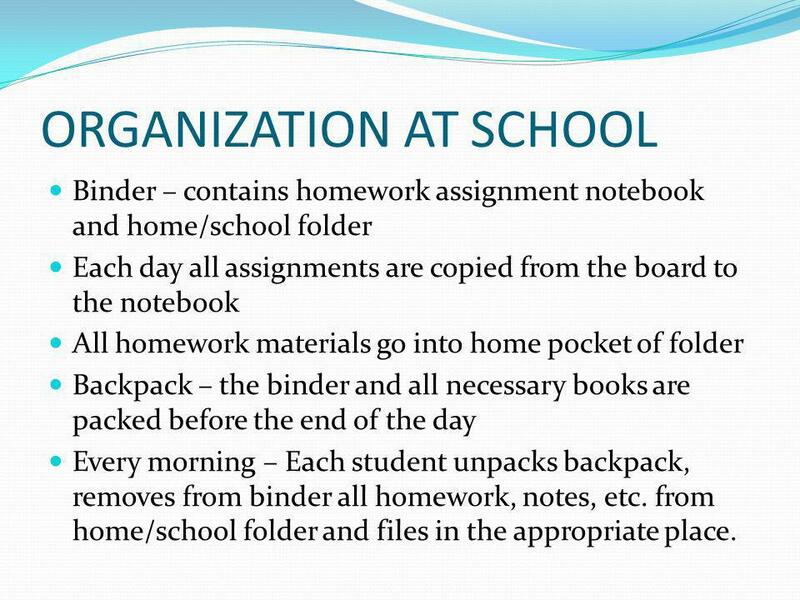 3 ORGANIZATION AT SCHOOL Binder – contains homework assignment notebook and home/school folder Each day all assignments are copied from the board to the notebook All homework materials go into home pocket of folder Backpack – the binder and all necessary books are packed before the end of the day Every morning – Each student unpacks backpack, removes from binder all homework, notes, etc. from home/school folder and files in the appropriate place. 4 CLASSROOM POLICIES Children should be at school by 8:00 after having a good breakfast to organize their work for the day. Students who arrive late (after 8:10) must sign in at the office accompanied by a parent. Good attendance is extremely important; please keep absences to a minimum. If absent, pick up work at the office after 2:00. 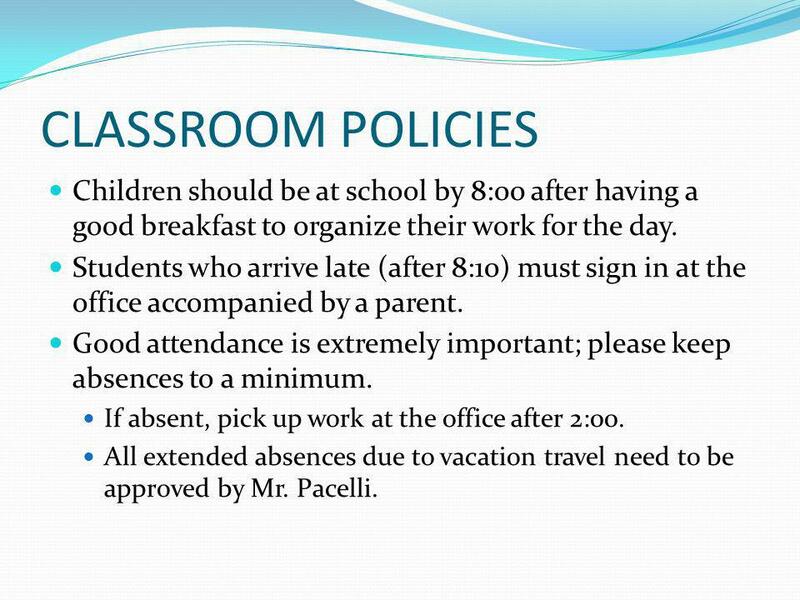 All extended absences due to vacation travel need to be approved by Mr. Pacelli. 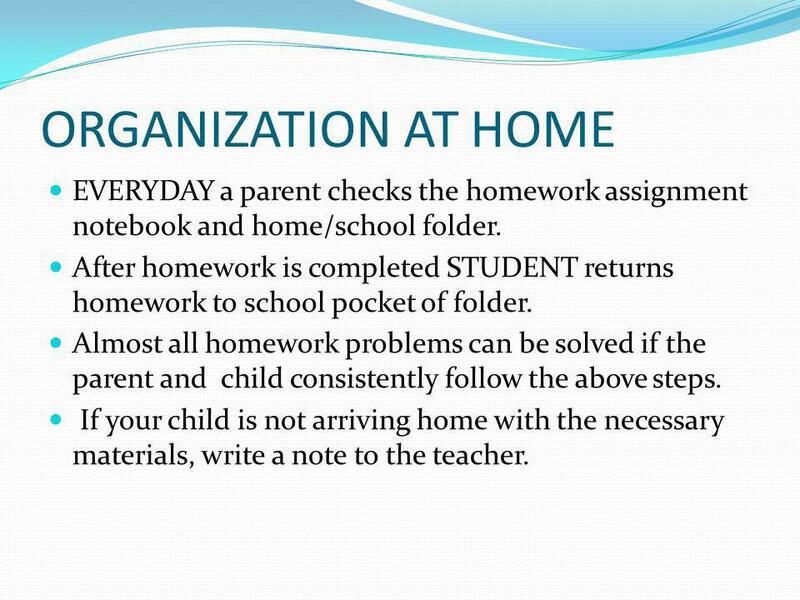 5 ORGANIZATION AT HOME EVERYDAY a parent checks the homework assignment notebook and home/school folder. After homework is completed STUDENT returns homework to school pocket of folder. 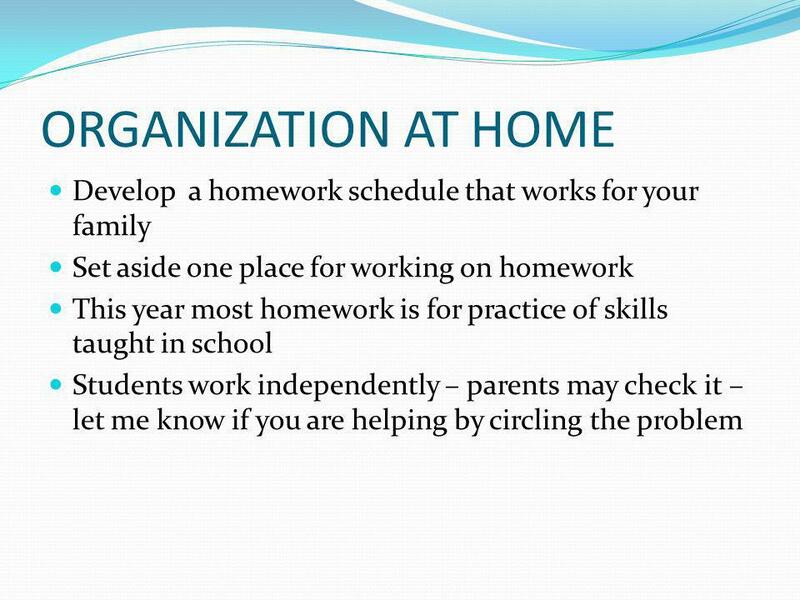 Almost all homework problems can be solved if the parent and child consistently follow the above steps. If your child is not arriving home with the necessary materials, write a note to the teacher. 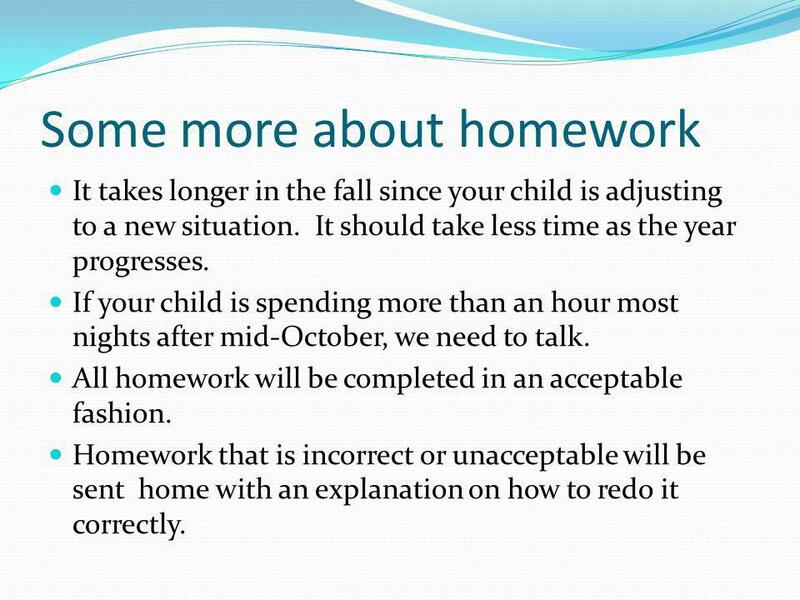 7 Some more about homework It takes longer in the fall since your child is adjusting to a new situation. It should take less time as the year progresses. If your child is spending more than an hour most nights after mid-October, we need to talk. All homework will be completed in an acceptable fashion. Homework that is incorrect or unacceptable will be sent home with an explanation on how to redo it correctly. 8 And even more about homework Missing homework receives a homework reminder slip. Slip must be signed by a parent after seeing the newly completed work, and the slip and homework will be returned the next day. 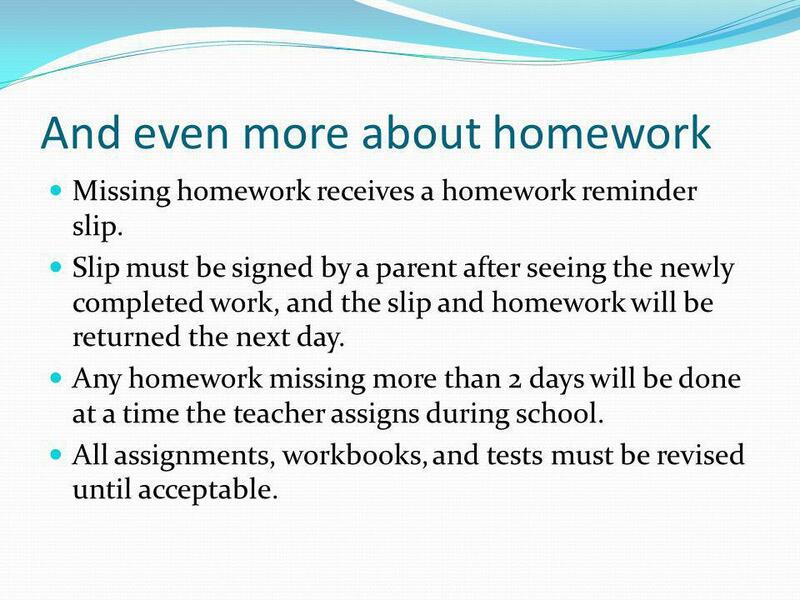 Any homework missing more than 2 days will be done at a time the teacher assigns during school. All assignments, workbooks, and tests must be revised until acceptable. 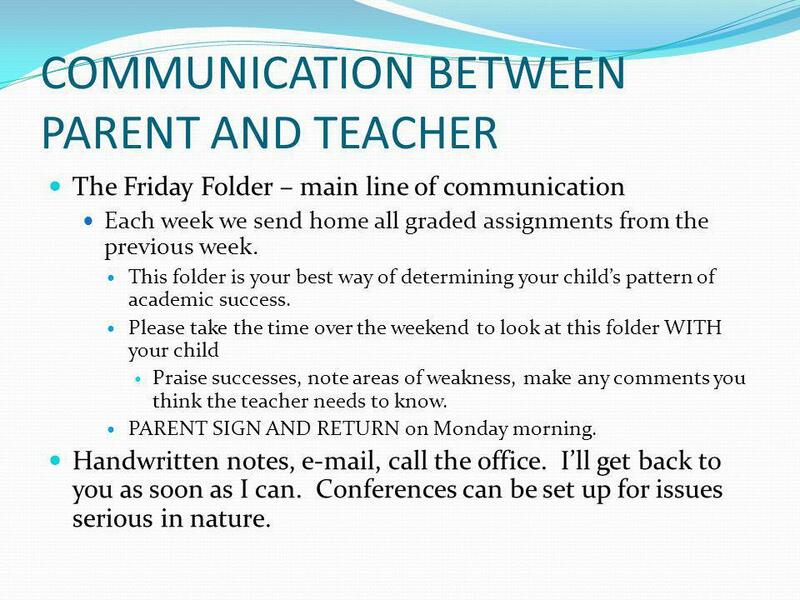 9 COMMUNICATION BETWEEN PARENT AND TEACHER The Friday Folder – main line of communication Each week we send home all graded assignments from the previous week. This folder is your best way of determining your childs pattern of academic success. Please take the time over the weekend to look at this folder WITH your child Praise successes, note areas of weakness, make any comments you think the teacher needs to know. PARENT SIGN AND RETURN on Monday morning. Handwritten notes, e-mail, call the office. Ill get back to you as soon as I can. Conferences can be set up for issues serious in nature. 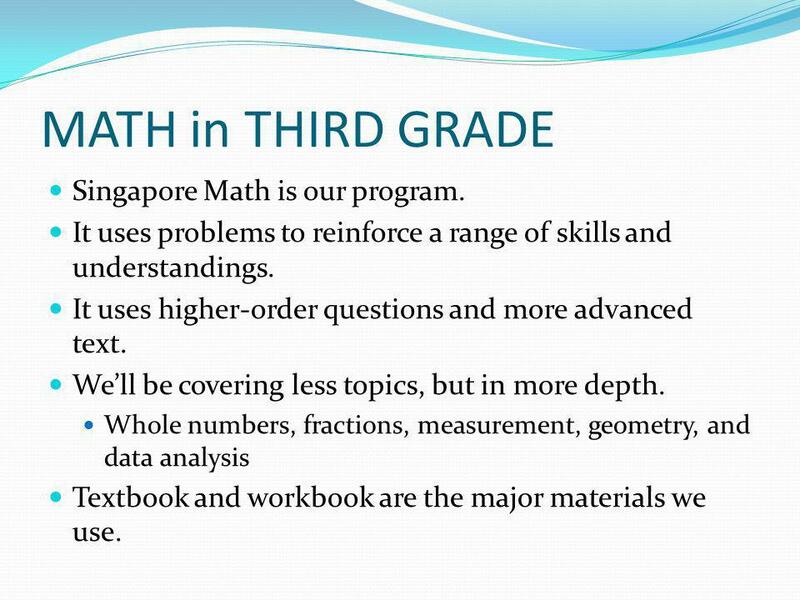 10 MATH in THIRD GRADE Singapore Math is our program. It uses problems to reinforce a range of skills and understandings. It uses higher-order questions and more advanced text. Well be covering less topics, but in more depth. Whole numbers, fractions, measurement, geometry, and data analysis Textbook and workbook are the major materials we use. 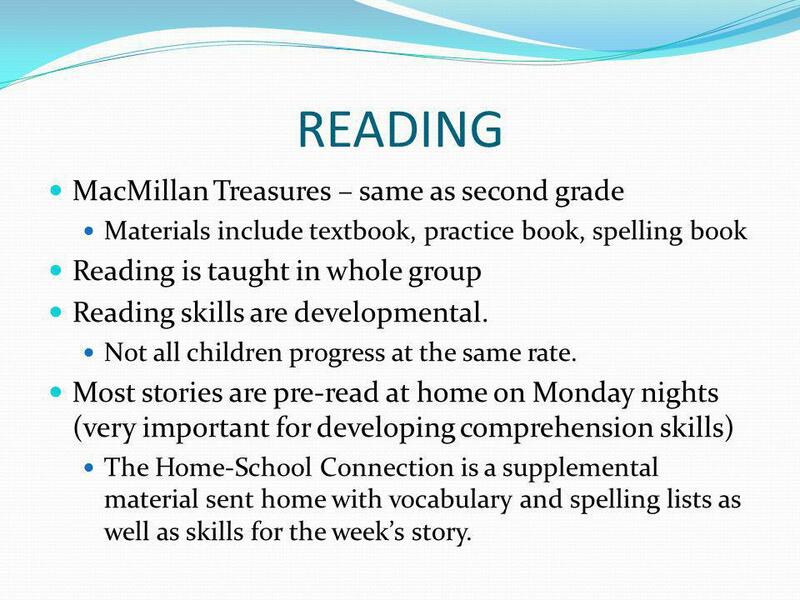 11 READING MacMillan Treasures – same as second grade Materials include textbook, practice book, spelling book Reading is taught in whole group Reading skills are developmental. Not all children progress at the same rate. Most stories are pre-read at home on Monday nights (very important for developing comprehension skills) The Home-School Connection is a supplemental material sent home with vocabulary and spelling lists as well as skills for the weeks story. 12 READING Scholastic News with its skill building questions is a part of our program. Stories are introduced in class then completed independently at home. 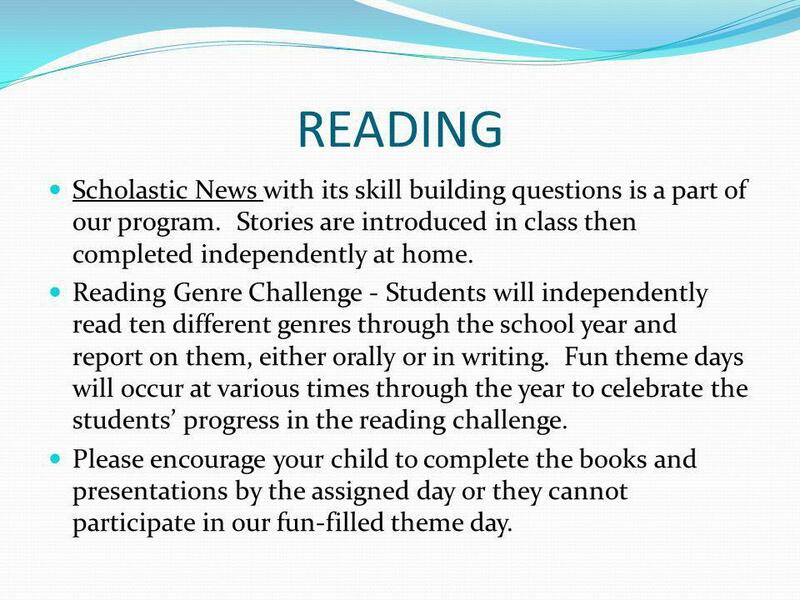 Reading Genre Challenge - Students will independently read ten different genres through the school year and report on them, either orally or in writing. Fun theme days will occur at various times through the year to celebrate the students progress in the reading challenge. Please encourage your child to complete the books and presentations by the assigned day or they cannot participate in our fun-filled theme day. 13 MORE READING NOVEL STUDY with Mrs. Pampel Six novels read in-class throughout the year Mrs. Pampel reads aloud to the students who each have a copy of the novel. 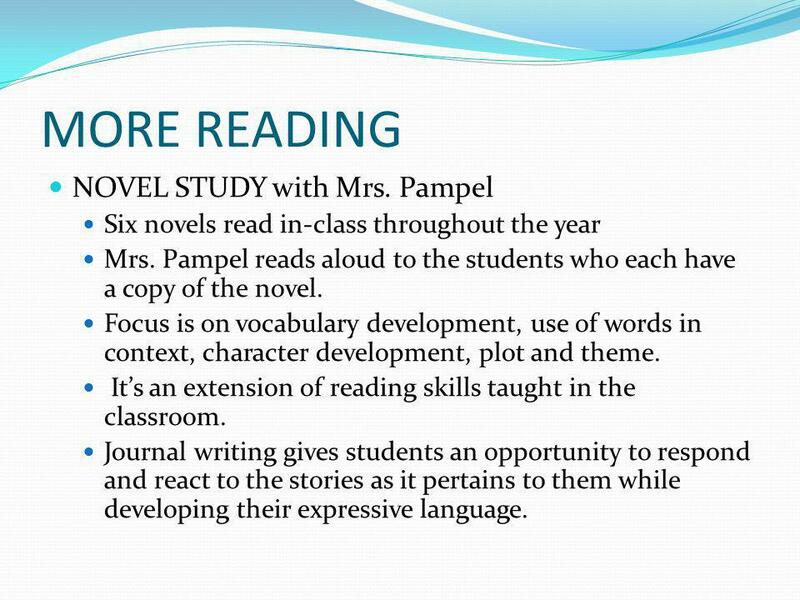 Focus is on vocabulary development, use of words in context, character development, plot and theme. Its an extension of reading skills taught in the classroom. Journal writing gives students an opportunity to respond and react to the stories as it pertains to them while developing their expressive language. 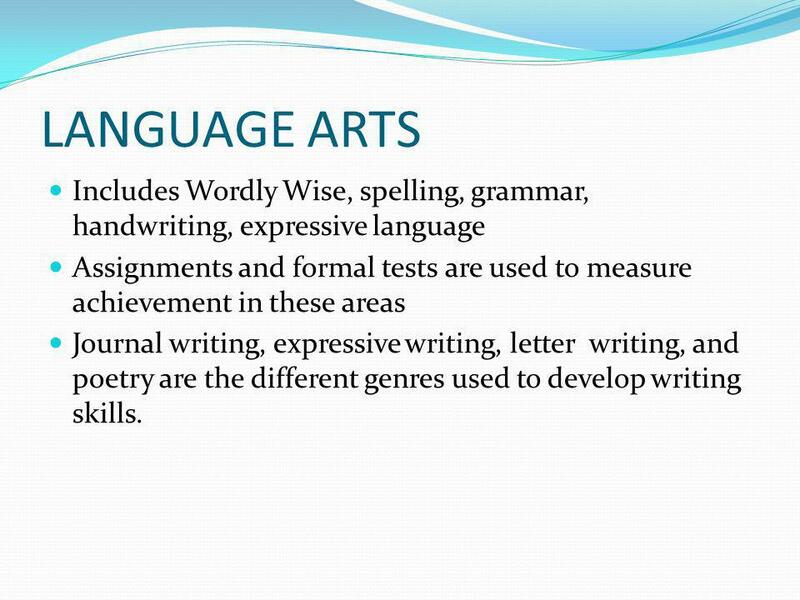 14 LANGUAGE ARTS Includes Wordly Wise, spelling, grammar, handwriting, expressive language Assignments and formal tests are used to measure achievement in these areas Journal writing, expressive writing, letter writing, and poetry are the different genres used to develop writing skills. 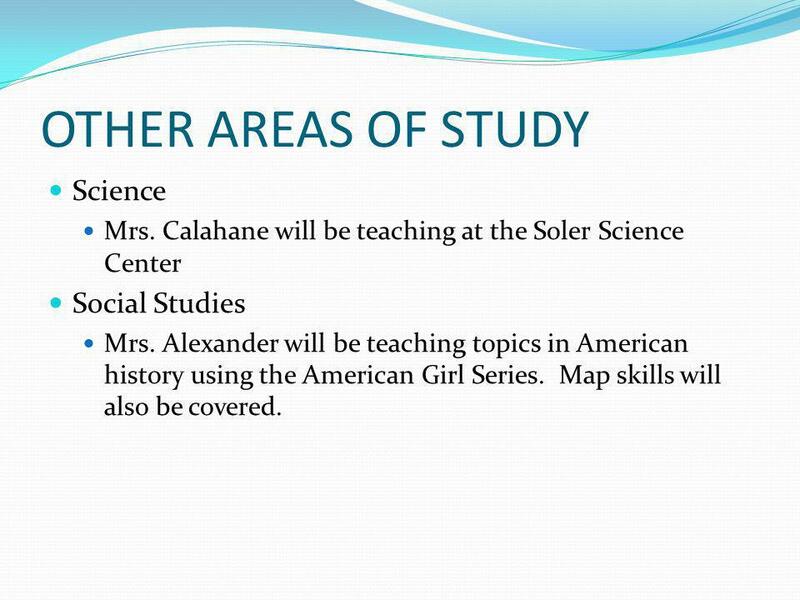 15 OTHER AREAS OF STUDY Science Mrs. Calahane will be teaching at the Soler Science Center Social Studies Mrs. Alexander will be teaching topics in American history using the American Girl Series. Map skills will also be covered. 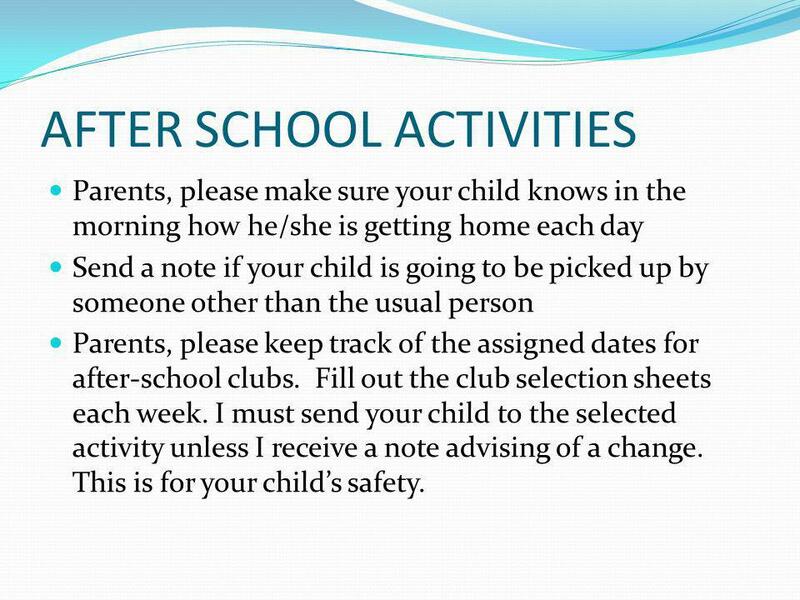 16 AFTER SCHOOL ACTIVITIES Parents, please make sure your child knows in the morning how he/she is getting home each day Send a note if your child is going to be picked up by someone other than the usual person Parents, please keep track of the assigned dates for after-school clubs. Fill out the club selection sheets each week. I must send your child to the selected activity unless I receive a note advising of a change. This is for your childs safety. 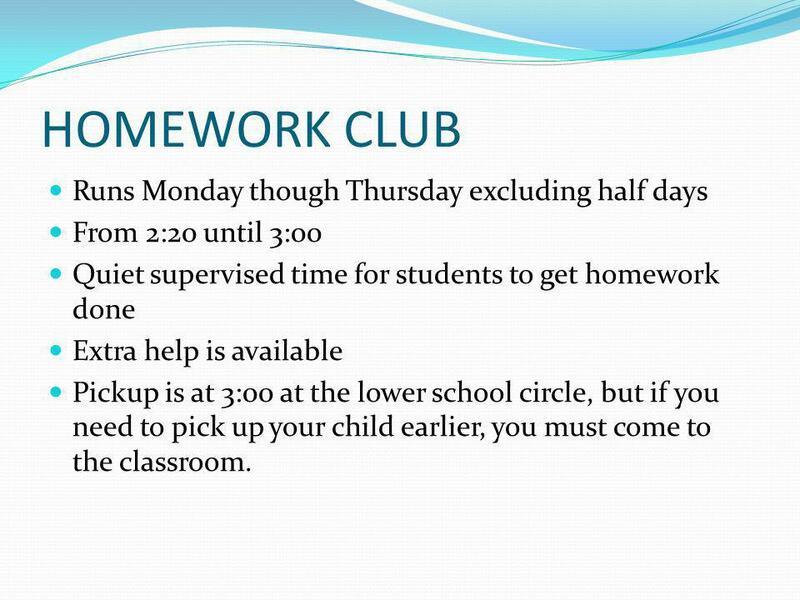 17 HOMEWORK CLUB Runs Monday though Thursday excluding half days From 2:20 until 3:00 Quiet supervised time for students to get homework done Extra help is available Pickup is at 3:00 at the lower school circle, but if you need to pick up your child earlier, you must come to the classroom. 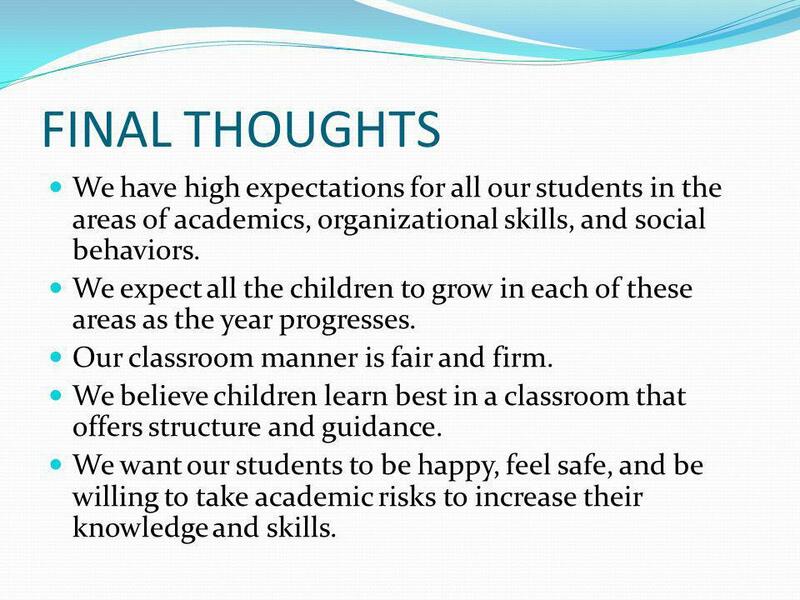 18 FINAL THOUGHTS We have high expectations for all our students in the areas of academics, organizational skills, and social behaviors. We expect all the children to grow in each of these areas as the year progresses. Our classroom manner is fair and firm. We believe children learn best in a classroom that offers structure and guidance. We want our students to be happy, feel safe, and be willing to take academic risks to increase their knowledge and skills. 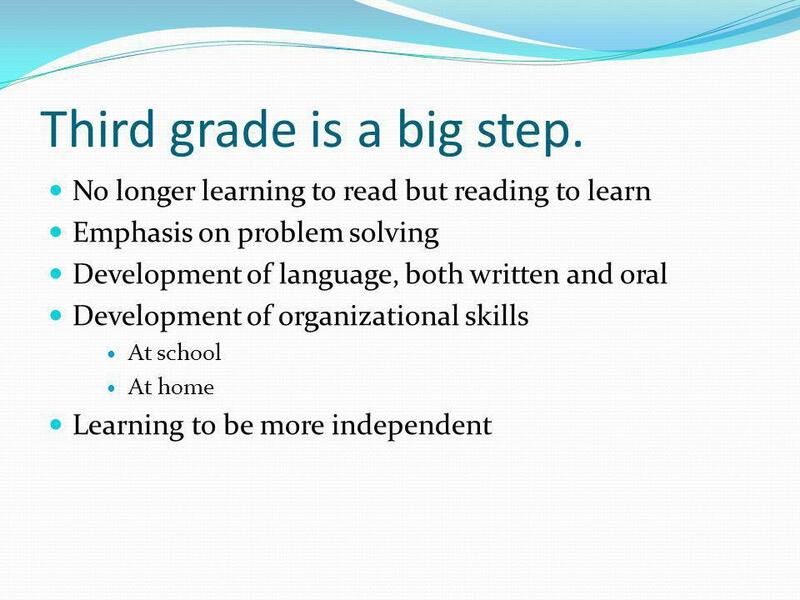 Download ppt "What you need to know to help your child have a positive third grade experience." Welcome! Donna Rosenbaum Fourth Grade All About Me! Received my Bachelor’s and Master’s Degree from the City University of New York-Lehman. Third and Fourth Grade Curriculum Night Mrs. Bergamini Mrs. Fulton Mr. Linko. Parents As Partners Mrs. Lord Grade 3. Goals My goals for each child are the same. I hope for each child to grow socially, emotionally, and academically. Welcome to our Third Grade Class Mrs. Tammy Davis Please Look Around! Also, please add your address on the sheet at your child’s desk! Welcome to Fourth Grade Curriculum Night Mrs. Joy Buettner Beaulac Mrs. Jessica Bixler Zajac Mrs. Jessica Bixler Zajac. WELCOME TO MSES FIFTH GRADE BACK TO SCHOOL NIGHT!. The Fourth Grade Team. A Look at Fourth Grade Language Arts Anthology Stories Whole and small group instruction Book Groups Emphasis on a variety of genres. Welcome to Parent Night! Mrs. Wilson Fourth GradeRoom 18. Parents As Partners Mrs. Carroll Grade 1. Welcome to Parent Night Mrs. Taylor 11 th year teaching at West 18 th year with District 47 Bachelor Degree in Elementary Education Master’s of. Welcome to 3 rd Grade!. MAPE schedule 8:45 – 9:25 A = Art B = Gym C - Music. Welcome to Room 87! Please have your student take you around to the room and share what we have been working on so far this year. We will begin the presentation. Welcome to Mr. Vins’ 3 rd Grade Meet the Teacher Night ! Agenda Curriculum/Subjects Schedules Communication & other important information Volunteer. Welcome to Parent Night 2014. Mrs. Taylor 11 th year teaching at West 18 th year with District 47 Bachelor Degree in Elementary Education Master’s of.